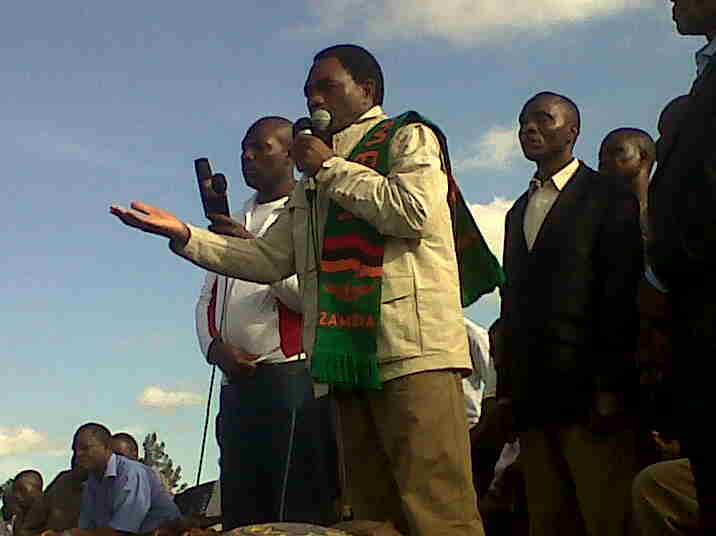 UPND leader Hakainde Hichilema has called on all well meaning media houses and people of Zambia to save the country from the jaws of PF dictatorship under Michael Sata. Hichilema also says his party’s candidate is poised for victory in the forthcoming by-election caused by Namulambe’s defection to the ruling PF. Hichilema who is in Mpongwe to drum up support for the UPND candidate Rapson Chilufya said the country was slowly drifting into a one party state but the people of Mpongwe had the power to break that chain by voting for Chilufya. “Our party is committed to bring development to your door steps, as I talk to you some of you have not yet received top dressing fertiliser and your crops have gone to ruin. Namulambe was MMD MP and the PF called him a thief for stealing hammer-mills they took him to court and now they are fielding a thief to stand on their ticket, what kind of reasoning is this?” Hichilema asked a huge crowd that attended his meeting at Munkumpu and St. Anthony areas. Meanwhile HH says progressive media houses and Zambian citizens must stand up against Sata’s dictatorial standards and also described the head of state’s action to release his confidential business documents to the media as victimisation. “Why is the president so scared about Hakainde, why should he be castigating businesses that I have worked for ever since I was 25 years and now I am 50 years old, I have never worked in the government, this is an act of victimisation,” said HH. He told the media to write objectively about the under development that the people of Mpongwe continue to face and vowed to continue talking against the bad things the PF government was involved in. He was speaking to journalists from the state and private controlled media houses covering the tensely contested Mpongwe polls. And former Kankoyo PF parliamentarian Percy Chanda has described Hichilema as a progressive and concerned leader who has abandoned his confort in Lusaka to come and campaign with the grassroots while other leaders have remained in Lusaka or are too ill to come to Mpongwe. Chanda refuted the tribal tag being attached to Hichilema by the PF and their media houses. “If you look at the composition of the UPND there are people from all over Zambia, even our candidate here is not Tonga, but this scheme (tribalism tag) is just being spearheaded by the PF and their sympathiser media houses to distract people’s attention,” said Chanda who is in the UPND Mpongwe campaign team. Reports reaching the Watchdog say HH is still in Mpongwe and has continued to attract huge following at his rallies and this is causing panic in the Namulambe camp to the extent that Namulambe has even pleaded for a ‘last time’ vote from the people saying he will not stand again in apparent reference to people’s complaints that he has taken them for granted after voting for him in 2006 and 2011 on the MMD ticket. Meanwhile, Namulambe has described his opponents and his constituents who are against his defection to the ruling party as shallow minded and people with no ambitions. This was in reaction to MMD candidate Miniver Mutesa who accused Namulambe of causing a costly by election at the expense of many challenges in the constituency. The sentiments have been echoed by UPND’s Rapson Chilufya and a cross section of Mpongwe residents who have accused Namulambe of taking them for granted after they voted for him in 2006 and 2011 on the MMD ticket. Mutesa said that Namulambe had failed the people of Mpongwe when he was twice given the chance to represent them and now deserved to be voted out. And reports reaching the watchdog say Namulambe has castigated the privately owned Daily Nation newspaper claiming that the paper has been writing falsehoods aimed at discrediting him in the February, 28th polls. He denied the allegations that he defected to the PF to serve his personal interest, saying if he was selfish he could have continued as MP and continue drawing a salary but stated that the decision was meant to enable the Mpongwe people benefit from the government programmes.